Not to be Captain Obvious, but: Finding the perfect apartment in New York City isn't easy. You usually need to compromise on something (let's hope it's not one of those bathtub-in-the-kitchen situations). A common obstacle? Railroad-style apartments — meaning the rooms are usually all connected in a rectangular layout. 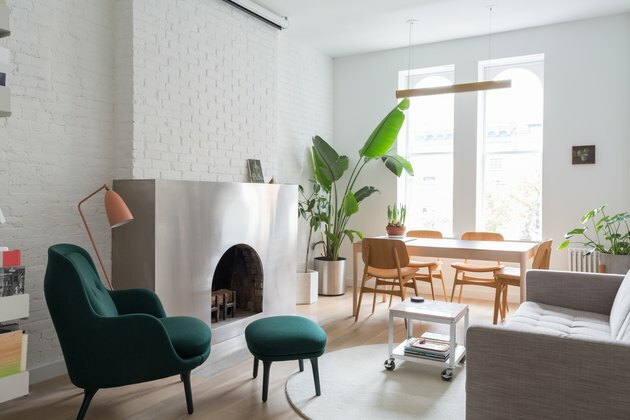 So for architects Daniel Rauchwerger and Noam Dvir of design firm BoND, their 520-square-foot West Chelsea home had beautiful bones, but also had that dreaded choo-choo layout that can be so difficult to work with. Their solution? Create one large open area. This turned out to be a great choice for the 11-foot-wide apartment, because the only windows were located at the front and back ends. 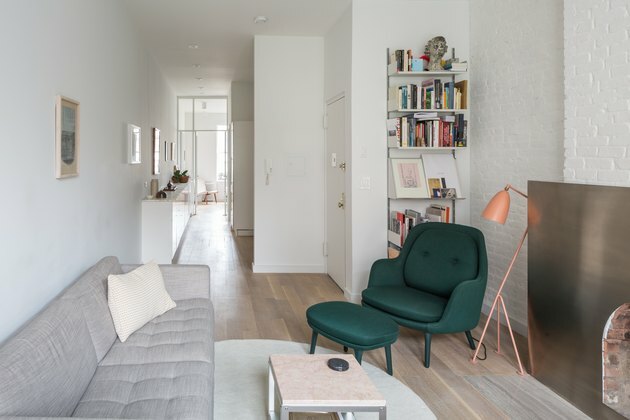 "We wanted to utilize the terrific daylight coming from three large windows on either end of the apartment and to allow this light to reach the middle of the apartment, which was previously dark and stuffy," says Dvir. Each room in the circa-1901 building needed an upgrade. 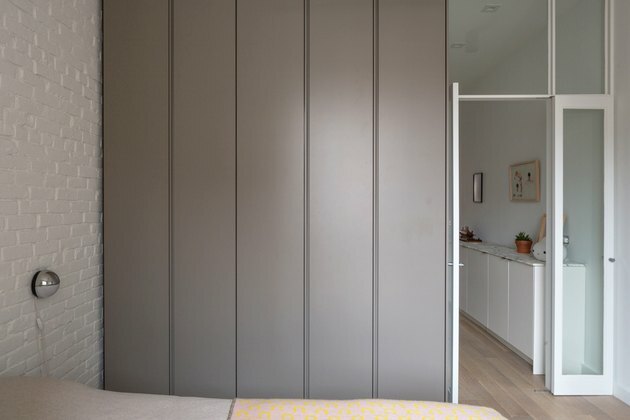 "Our goal was to create a seamless space that will reflect our lifestyle: a generous space for hosting, a convenient kitchen (we cook almost every day), an upgraded bathroom with a large stand in-shower, and lots of storage space," says Dvir. The working fireplace (a rarity in Manhattan!) was original to the home. To update the look, BoND commissioned a stainless steel wrap from a Chinatown workshop. A powder-coated Vitsœ shelf is the ideal length and width for a corner in the living room. 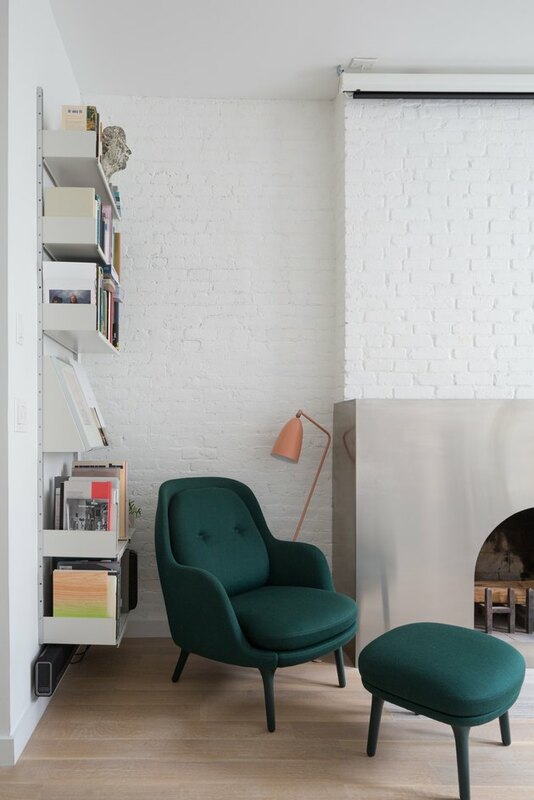 The forest green armchair and ottoman are from Suite NY. 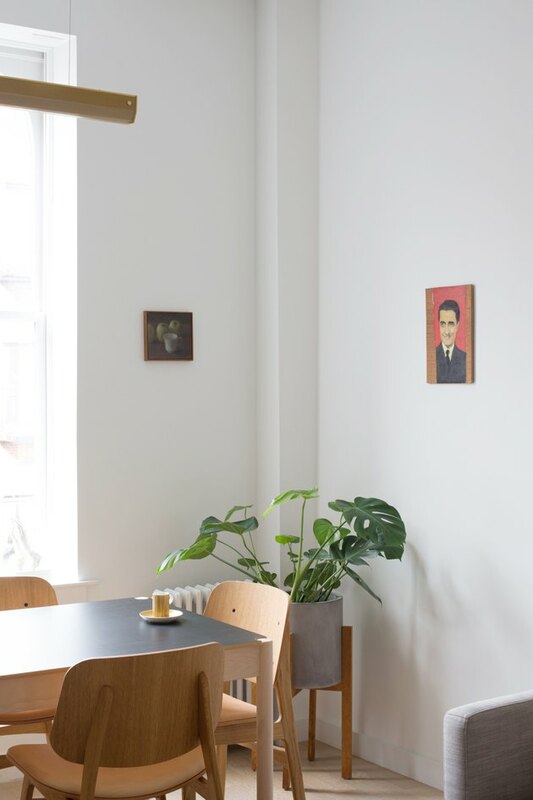 A HAY table surrounded by Fredericia chairs were both purchased at Danish Design Store. 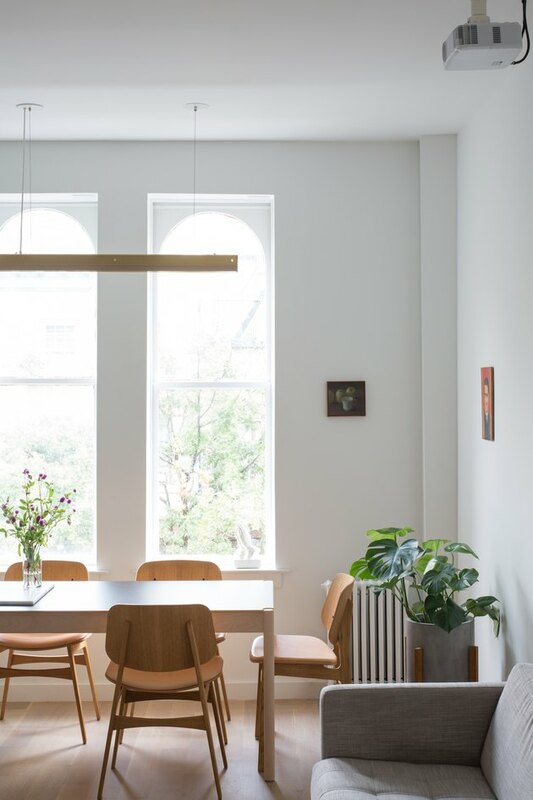 The linear pendant lamp from Rich Brilliant Willing is a subtle echo of the apartment's straight layout. The art is a personal touch. "Both my parents are artists," says Rauchwerger. "So the art that we have is mostly things that are made either by my parents or people in their circle of contemporary Israeli art." 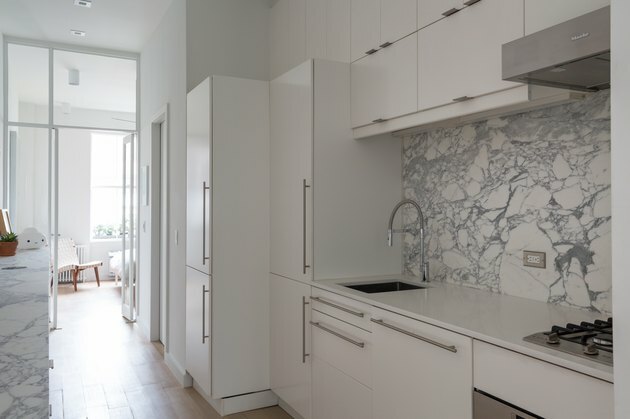 In the kitchen, "hacked" IKEA cabinets are paired with custom-cut Caesarstone marble countertops. The minimalist bedroom offers a curated selection of furniture and accessories that play on dimension and texture. The bedside sconce is from Rich Brilliant Willing; the bed is Luciano Bertoncini. A closet from Italian furnisher Molteni&C introduces vertical lines to emphasize height in the linear space. 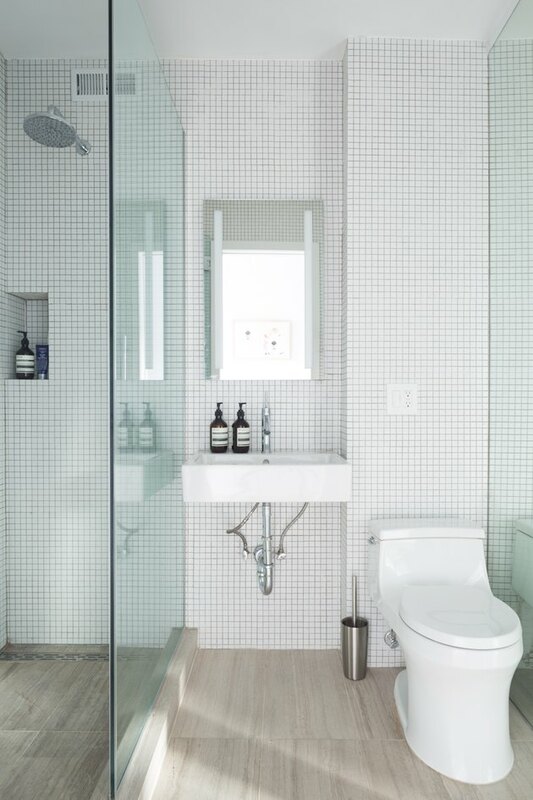 An open shower maximizes space in the small bathroom.